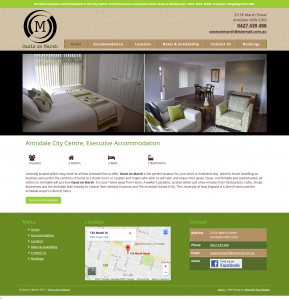 Below is a list of clients we have worked with in the accommodation industry. You need someone on your side to keep up with the online trends for accommodation. Please contact us for an obligation free discussion about how we can help your business. We pride ourselves on providing an effective online presence for you with ongoing support. 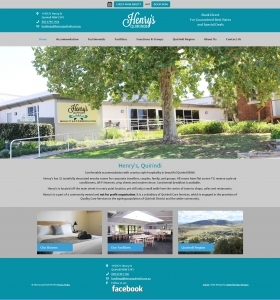 Henry's provides comfortable accommodation with country style hospitality in beautiful Quirindi NSW. We built their original website in late 2015. We have built them a new website to keep up with changes to technology and Google. We also provide ongoing social media support with regular Facebook updates. 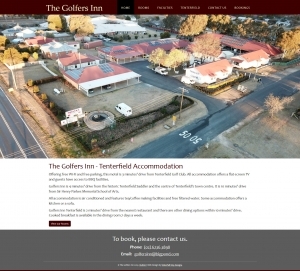 The Golfers Inn is a Tenterfield accommodation business. 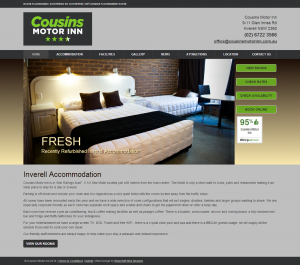 They have a great variety of accommodation options, from motel rooms to 5 bedroom houses. We did Peter's original website back in 2013. 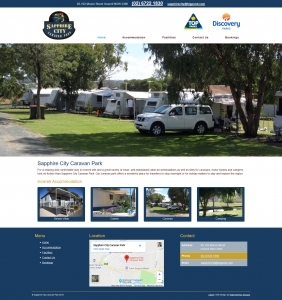 Due to the increased use of mobile phones, he had us upgrade his website in 2019. He is also winding back his 3rd party booking sites and increasing his direct enquires. The website is now more mobile friendly, encrypted with an SSL Certificate and he also signed up to our monthly package. Texas Motel has 10 ground floor rooms featuring queen-sized beds and hot showers. 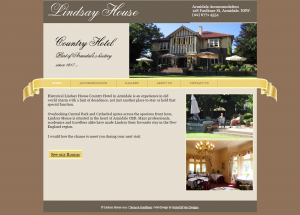 They have a fully licensed a la carte restaurant and room service is available. 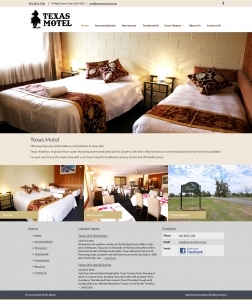 For your next trip to the region stay with us at Texas Motel for traditional country service and affordable prices. Greg and Heather were referred to us through word of mouth from another client of ours. We look forward to helping marketing their business online. 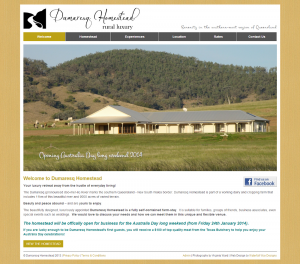 Dumaresq Homestead is a luxury rural farm-stay west of Tenterfield. The beautifully designed, luxuriously appointed Dumaresq Homestead is a fully self-contained farm-stay. It is suitable for families, groups of friends, business associates, even special events such as weddings. Most of the 30 units have recently been refurbished and feature a contemporary interior and all the mod cons you need. The majority of the rooms are AAA-rated 4-star rooms with deluxe ensuite bathrooms. 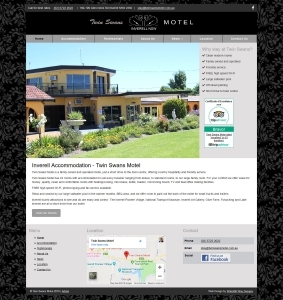 Moffat Falls has a variety of accommodation surrounded by World Heritage Listed National Parks. Spend your days fly fishing or bush walking. They also have experienced guides to take you fly fishing. Escape to ebor wilderness now. 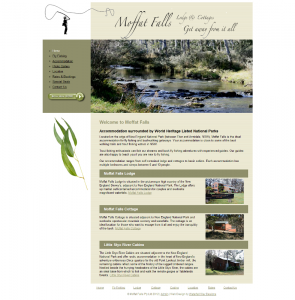 Website to present Moffat Falls accommodation and fly fishing trips. 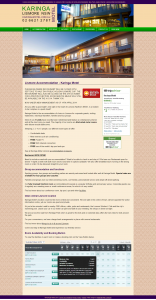 To inform and entice visitors and to make booking easy. 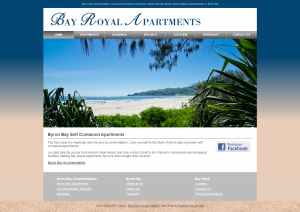 Bay Royal is a luxury apartment complex located on the main beach at Byron Bay. These self contained holiday units are well appointed with amazing views and only a short stroll to all of Byron's restaurants and shopping facilities. 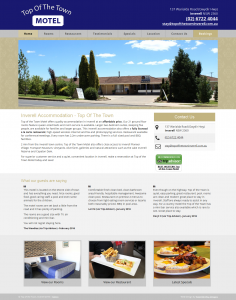 Bay Royal selected Waterfall Way Designs for hosting and ongoing maintenance of their existing website. We did a website redesign in Sept 2012. 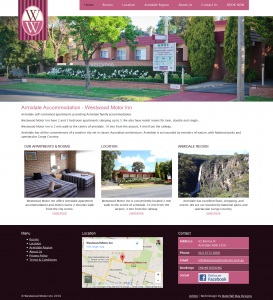 Warren Motor Inn with 15 ground floor units in close proximity to all Warren has to offer. 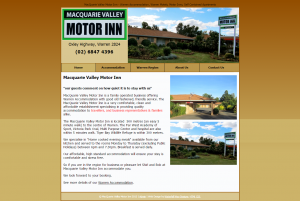 Website to promote the Motor Inn to individuals, families, and business representatives looking to travel in the region.